This Kreature is the meta-form of Snowble. 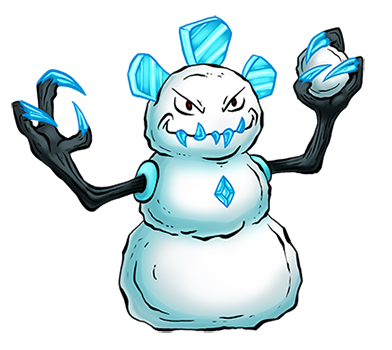 Designed as a polar infantry Kreature, it can use the ice gem on its chest to conjure snowballs that explode upon impact. It is a highly skilled marksman, capable of throwing its snowballs with such pinpoint accuracy that it can knock a pebble off tree stump from 500 yards. If it runs out of ammunition, it will resort to hurling Snowble at the enemy. It is highly territorial, and groups of Snowblins will fortify their home with icicle-filled trenches and reinforced ice walls.